It was heartening to see the Japanese fans, after witnessing their team lose to Greece in the FIFA World Cup Match in Brazil on 19 June 2014, and also in Russia 2018, set an example of true sportsmanship by cleaning up the stadium of all the garbage left there. This habit of correct disposal of garbage got to be nurtured at home – a habit that needs to be inculcated in all the citizens – irrespective of age. In India, you keep your home clean, but throw the garbage in the street or in any vacant area and the cities do not have a garbage collection policy or methodology. In Canada and USA, this habit begins at home (some exceptions –especially from the immigrants from the sub-continent), and is further firmed up at the school. This is where the children are made aware of their responsibility to ensure a clean environment and also respect the mother nature. The children are taught the correct procedures for sorting and disposing garbage. Garbage collection in Canada is the municipal responsibility and is collected on a weekly basis. The limits are laid down by the city. In our city the limits per home are two bags (each not more than 20 kg) of general unsorted garbage, recyclables – unlimited (Blue Box), compostable (Green Box)- unlimited and yard waste (Brown Paper Bag) – unlimited, but collected on seasonal basis. Only catch is that one got to segregate the garbage according to the above classes and put them in separate special bins provided by the city. Do not worry, nothing comes free in North America (there is no “raddiwala” who will ever pay for your garbage). We pay a heavy house tax to the municipality for these services. Any hazardous goods, or any heavy garbage is to be taken to the recycling centre and they charge you for accepting your garbage. Studies in the City of Mississauga, where we live, indicate that the average household generates 567 kg/year of waste, of which 34 percent is garbage, 13 percent is recyclable and 45 percent is organics. The general garbage is incinerated and the heat produced runs a steam turbine and electricity is generated. Some cities use landfills too. 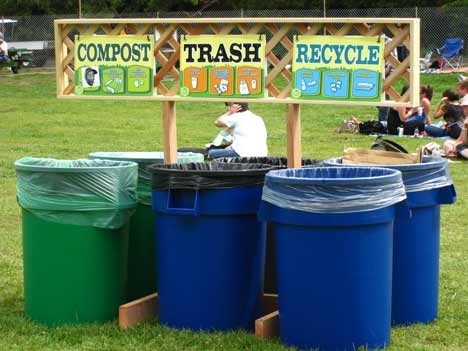 The recyclables are recycled and the compost is sold to the residents at a minimal cost, after due decomposition. At every school, mall, park, bus shelter, restaurant etc, where ever garbage may be generated, you will always see garbage bins – with different buckets for waste and recyclables. Anyone depositing garbage are expected to do so in the specific bins (here again people from the sub-continent are the culprits). Only problem of applying the same in India is that the general garbage and the compostable will have to be picked up on a daily basis as the day temperatures are much higher when compared to Canada. It may also put some raddiwalas out of business too. Goodwill Stores. Reducing the amount of waste we generate by reusing and recycling items instead of discarding them helps save natural resources, conserves energy and decreases the need for landfill. Any household items that are gently used and in working condition, consider giving them a new home instead of throwing them in the garbage. We drop off our reusable old clothes, books, toys, household appliances and furniture at a store run by the city or at the Recycling Centers. They clean them and in case found fit for reuse, will sell them at a very cheap price to the needy – and the name of the store is “GOODWILL”. When we landed in Canada we stayed in the basement apartment of a house and all our furniture came from the same “GOODWILL” store. It was a real GOODWILL. RETHINK – your waste and adopt environmentally-friendly practices! REDUCE – the amount of waste you produce. RECYCLE – materials through the Blue Box or Green Bin Programs or donate them to a Community Recycling Centre so that others can create new uses for them. RECOVER – refers to generating energy-from-waste (e.g. through landfill gas-to-energy). Organics Recycling. Organic material includes such things as food waste and used tissues or paper towels. Organics recycling diverts this material from landfill by converting it into a useful end product – compost. In 2012 the city diverted almost 51 per cent of waste through the first 4Rs and recovered an additional 25 per cent by converting waste to energy. About two-thirds of the solid waste collected in Mississauga is incinerated at the Algonquin Power Energy-from-Waste facility – a 15 Acre complex located within the city limits. A clean and efficient operation that not only gets rid of the waste but also generates 9 megaWatt of electricity, enough to provide power for up to 6,000 homes. At temperatures in excess of 1,000ºC, most of the waste is vaporized but, just like burning wood in a fireplace. There is always some ash created in the combustion process. Not too much of a problem for a wood burning stove but a considerable problem when you are incinerating 18,000 truckloads of waste a year. The by-products include 40,000 ton bottom ash and 3,000 ton fly ash. Bottom ash is a non-hazardous by-product of combustion, a glassy, sand like material of melted sand and lime, with smaller amounts of oxides. It is disposed in the local landfill or used as an aggregate in hot mix asphalt or is blended with other aggregates, but is usually less durable than conventional aggregates. The exhaust gas leaving the boilers is directed to two parallel air pollution trains which are designed to absorb 90 per cent of the acid gases by the injection of hydrate lime and to remove 99.9 per cent of all particulate using fabric filter bag houses. Continuous emission monitors are utilized both for control and monitoring of the flue gases. These units are calibrated automatically each day and quarterly audits and annual relative accuracy tests are conducted.